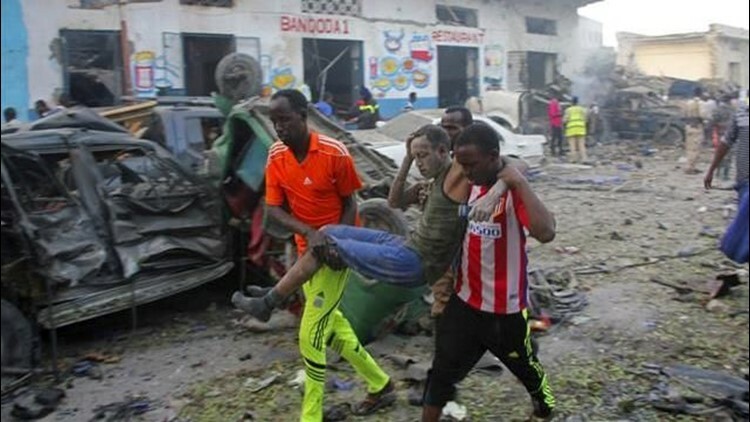 MOGADISHU, Somalia (AP) — A suicide truck bomb exploded outside a popular hotel in Somalia's capital on Saturday, killing at least 23 people and wounding more than 30, and gunfire continued as security forces pursued other attackers inside the building, police said. Two more blasts were heard, one when an attacker detonated a suicide vest. Speaking to The Associated Press by telephone from the scene, Capt. Mohamed Hussein said 30 people, including a government minister, were rescued from the Nasa-Hablod hotel as heavy gunfire continued in the standoff between extremists and security forces. Three of the five attackers were killed, Hussein said. The others hurled grenades and cut off the building's electricity as night fell. Saturday's blasts came two weeks after more than 350 people were killed in a massive truck bombing on a busy Mogadishu street in the country's worst-ever attack. "I think they were al-Shabab fighters who were trying to storm the hotel," he said, lying on a hospital bed. He suffered small injuries on his shoulder and skull from flying glass. Security officials say Saturday's bomber had pretended his truck had broken down outside the gate. Police Col. Mohamed Abdullahi says the bomber stopped outside the heavily fortified hotel and pretended to repair the truck before finally turning it around and detonating. Somalia President Mohamed Abdullahi Mohamed said the new attack was meant to instill fear in Somalis who united after the Oct. 14 attack, marching in the thousands through Mogadishu in defiance of al-Shabab. Since the blast two weeks ago, the president has visited regional countries to seek more support for the fight against the extremist group, vowing a "state of war." He also faces the challenge of pulling together regional powers inside his long-fractured country, where the federal government is only now trying to assert itself beyond Mogadishu and other major cities. A 22,000-strong multinational African Union force in Somalia is expected to withdraw its forces and hand over the country's security to the Somali military by the end of 2020. U.S. military officials and others in recent months have expressed concern that Somali forces are not yet ready.